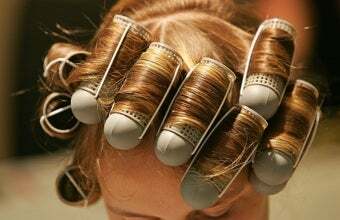 Though our Beauty 101 series has mostly focused on cosmetics thus far, today, due to popular demand, we're going to focus on our readers hair concerns. And away we go! When do people wash it? How often? How am I always the only person ever walking around with wet hair? Does everyone but me use a blow dryer? It takes my hair about eight hours to dry naturally and it's super thick and curly, so blow drying it is always really difficult. I have no idea what to do with it. Halp! Hairstyles for thin/fine hair! Hair in general! Styling fine, limp and straight hair. Taming thick and unruly hair! Curling hair! Or doing things with hair. All I have is a ponytail, half-up-half-down, or down. I need something else in my hair arsenal. Vintage inspired hairstyles? Not exactly a basic, but I'd sure love some tips. I cannot fix my hair AT ALL. Somehow I manage to mess up even putting in a headband. For real. When I see women with those ponytails with the slight bump near their forehead, I am totally mesmerized at how they do it ... Or with barrettes placed in just so? Honestly, I have no clue. I still have no idea how to use bobby pins to do a French twist. I will say, as a young black woman, I can NEVER get my hair to look like it looks when I come home from the Dominican hair salon. Anyone with the same problem? tips? product recommendations? I generally use Motions products. I don't know how to blow-dry my hair. I don't really want to learn though; the noise makes me jumpy and it's bad for your hair anyways. Still, waiting for my hair (which is pretty long) to air dry is a pain. I can't do my own hair at all. Seriously, I think I was in college when I finally learned how to braid my own hair (with the use of online videos). I still can't curl it, or do anything beyond ponytails and braids. My mother is a hairdresser. Thus I never learned to do my own long, straight, boring hair besides dying it. I can barely braid (only one down my back will actually look good) and it doesn't hold curls unless I hairspray it to within an inch of its life. I am hopelessly inept at my hair. I had pin straight hair growing up, and then in my 30s it started getting wavy and I have no idea how to handle it! I buy every product and it always turns out badly - never the same, never as planned! I cannot style my hair. My wash-and-go (with maybe a quick swipe of the hairbrush on my morning commute) usually looks a million times better than anything I can create with blow dryers, straighteners, and curling irons. I mean, seriously, if I dry my hair, it looks limp and straight. If I let it air dry, it has body and a little bit of a wave. Fancy hair, styled hair, anything other than wash-and-go, I just can't do it and I've really, really, really, really tried. 1. How do I style fine/thin hair? How do I add volume? 2. How do I style wavy/curly hair? How do I deal with frizz? 3. How do I properly straighten my hair? How to I properly curl my hair? 4. Should I wash my hair every day? Every other day? What about conditioner? 5. How do I style it for special occasions? Vintage styles? Braiding? 6. How do I properly blow dry my hair? How do I properly use a curling iron? 7. How do I get my hair to look healthy? How do I get it to grow faster? Think you can help? Leave your answers in the comments below, or send me an email with "Hair" in the subject line. Due to space issues, I can't use every answer, but I appreciate all of them, and your fellow commenters do, as well! A roundup of advice will be posted tomorrow afternoon.